Writing books with quality contents pays a lot, like wise selling other good products. But it does not end with good contents or product. You need to optimize your product's content, title, subtitle, categories, bullet point, etc. with keywords in such a way that is friendly with search engines like google and amazon. Also note that different search engines have different algorithms. 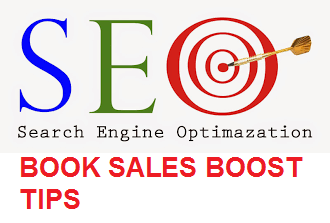 So you need to understand the algorithms of different search engines, especially Google and Amazon if you want to really increase your book royalty earnings, Search Engine Optimization (SEO) is very important if you really want to boost your book's and product's rank and sales. 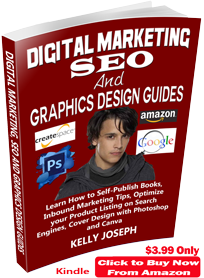 This is because more than 80% of sales on Amazon, CreateSpace and other book marketing platforms come from searches on Search Engines like Google and Amazon Search engines. There are some extra steps you need to know, which I will reveal in here! In this tutorial article, I will walk you through on how you can dramatically optimize your products ranks, sales and for Google and Amazon Search Engines. Most search engines have different algorithms which you must understand if you want your products to be friendly with them. I will also show you how to tweak your product's keywords in the title, description, bullet point, etc. to yield optimum sales without violating any of the policies of Amazon. I will also show you some relevant SEO tools and feedback software both free and paid ones that will help you optimize your amazon product listing. Google expects and encourages webmasters to structure the data or content of their websites. Amazon on the other hand, use their product page index to structure the data by themselves. Webmasters need to understand structured data analysis before their web pages can rank well on google search engine while amazon sellers or authors don't necessarily need to fully comprehend it for their products to rank well on Amazon search engine. But if you are an author and you are really concerned with your product's rank google search engine, then you need to understand Google Structured Data Mechanism (which may require you to create a website for your product). When a keyword is searched on google, it displays web pages with lots of information about the searched keyword. 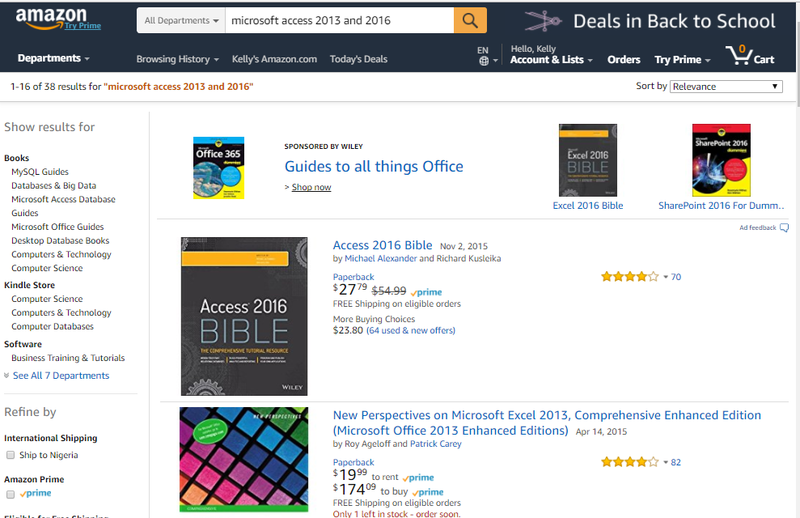 But if the same keyword is searched on amazon's search engine, it displays products that have lots of information about the search keyword with their prices. 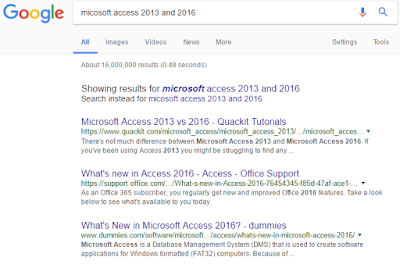 Below are the screenshots of search result and format for the search keyword: "Microsoft Access 2013 and 2016" in google and amazon search engines. Google search engine rewards webmasters whose site contents was able to satisfy a search customer and whose sites converts well in terms of the ads (AdSense) that appeared by placing their page links at the top of the search results. Whereas Amazon search engine rewards sellers whose products has the highest number of sales with time and also whose products was able to satisfy a buyer's needs by also placing their products on top of product search results. Now compare that to the basic way to build a web page. As a webmaster, in other to gain popularity and trust on Google search engine, you have to spend a lot of your time optimizing your off-page signals. You build links, manage a social media presence, etc. which are the signal google use to measure your site's popularity and trust. Amazon search engine does not really care about these. Their main ranking criteria is the number of sales a product was able to accumulate with time, that is how many buyers that really bought your product after visiting your product page. Google values web pages that have quality unique contents. Amazon does not care about the uniqueness of the product page content. They are only interested on the search keywords that were able to convert searchers to product buyers. This elaborates the need to research for keywords that will really help your product search and descriptions convert to sales on Amazon since your interest as a product seller or book author is to earn higher royalties from your products and books. 1. Relevancy: That is, what is going to be most relevant for searchers to buy. 2. Sales: That is, what sells the most, converts the best and provides the most profit for you as a seller and for amazon as a company. Now that you have fully understood the key differences between Amazon and Google Algorithm, let me now walk you through the various aspects of your product's page to optimize for an increased sales on Amazon. Your product super URL is optional. That means, it is not available by default unlike the Canonical URL. You can generate it if you wish. I will elaborate more on the last two on the above list. 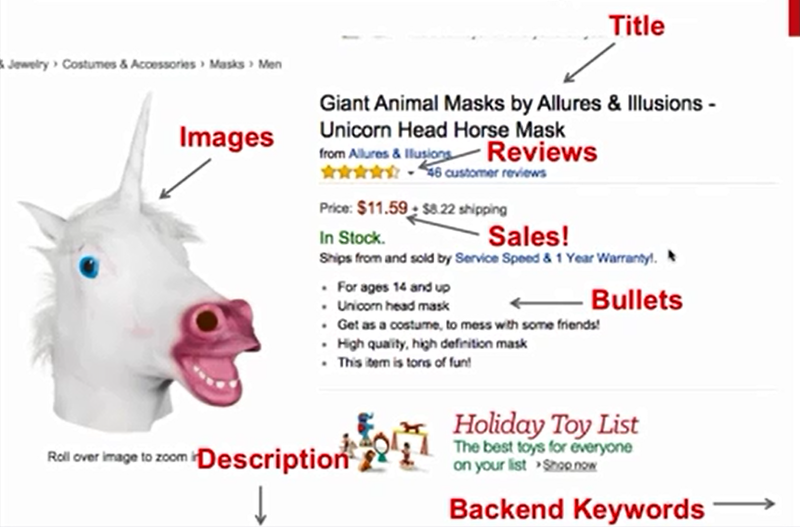 Below is a labelled screenshot of the product page of one of the popular product, "Horse Head Mask" and the screenshot of a kindle book page with long title strategy on Amazon. This is because what their products portray on the surface may be misleading. Most of these best selling Authors get such rank through the back door and once Amazon notices their trick, they punish these best sellers severely. Always go through the right way if you want your product to sell for a long time on Amazon. Your book's or product's title and sub-title are the second thing after your product image that should attract a shopper or searcher to your product. This is where you put some of your product's main keywords. 1. Do not jam pack keywords in your product title. It does not cause higher search ranking, rather it negatively affects your product ranking on Amazon. 2. Check your title and category style guide regularly because Amazon changes these rules from time to time and most time, some new rules counters some former old rules. 3. Your product title and sub title should not for any reason exceed 200 characters (not even 201 characters!). Search engines truncate like google truncates titles in their search result at the 72nd character. Also, Amazon has a suppression rule that ranks down products whose titles are more than 200. 35 Characters (mostly on kindle phone reading apps and some smartphones). 76 Characters (mainly on most smartphones and some small tablets). But some wide, high resolution tablets truncate the title after 140 characters. 115 Characters (mainly on desktop computers). Both short and long titles yield good sales if optimized properly. Always experiment to see the one that suits you more. Putting your main keyword(s) ensures that it will be included in your product canonical URL slug. I will explain this later in detail. Images of your products is the first thing that will attract a buyer even before he or she reads the title. That is why it is always advisable to optimize your images for your products. For book authors, always use professional book covers. I wrote explanatory tutorial articles on how to design professional book covers using Canva and Adobe PhotoShop respectively. 1. Always use relevant and catchy images strictly follow Amazon's product image placement guidelines. 2. Add about 3 to 6 images for your product. 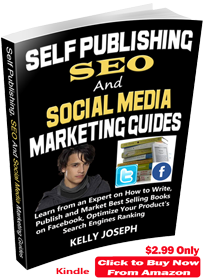 Don't use only one product image because it reduces your book sales rank. 3. For products apart from books, use images with dimension more than of 1000 pixel x 1000 pixel. This is very important especially for different products because it is a good place to put some of your main keywords and some few minor keywords for your products. You list the top features of your product. 1. Make it attractive and relevant. Don't jam pack them together. Space them out! 2. Stress your main points. If possible, use all-caps for your main keywords or points. 3. Don't stress more on branding information, instead stress more on the product features. Be specific. Always give the benefits and features of your product. 4. Don't make it too lengthy. Recommended length for each bullet point is 150 to 200 characters. But it most depends on your product category. Some categories have about 100 character limits. 5. Always use clear sentences or phrases because "clarity supersedes cleverness". Don't try too be too clever or smart always. Do it the right way and people will appreciate your work. 6. Create your most powerful points or content in your first three bullet points because the first three show up when your product page is viewed form any device platform. 7. Always overcome objection - Try to prove to customers that your product is superior to those of your competitors. by telling them the problems your product can solve. But don't castigate your competitors! 8. Address your audience individually. This will make them feel that you really care about them. Do not address them as a group. This is another part of your product page that is of paramount importance because almost all your keywords go here and helps to increase your keywords density. There some strategies you must follow to write a good and appealing description for your product. If you get it wrong, Amazon will penalize you by reducing your product rank on search engines. 1. Don't make it too short or too long. The recommended range is about 500 to 800 characters. 2. Answer all your customer's possible questions. Don't wait until they voice it out in their review. 3. Include all your keywords here both the minor and major ones and repeat your major ones after about every 100 to 150 characters. Be very careful not to overdo it else Amazon will penalize you. 4. Split your description write-ups into short paragraphs, even if your description is long. This will make it more readable and comprehensible. Don't jam pack it. 5. Always address a new issue or point in a new paragraph. 6. Use bullets or asterisks to list your important points or features. <b>, <br>, <em>, <font>, <h1> to <h6>, <hr>, <i>, <li>, <ol>, <p>, <pre>, <s>, <strike>, <strong>, <sup>, <u>, <ul>. See a list of supported html tags for Amazon and CreateSpace and their description here. 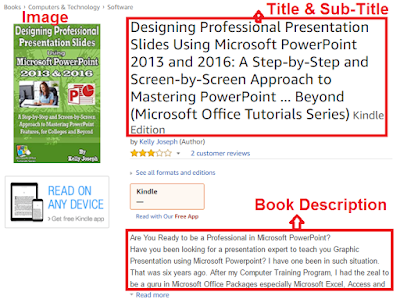 Formatting your book description with HTML tags is a very important Search Engine Optimization strategy and also increases your books and products rank on Online Sales Platforms like Amazon and CreateSpace. Before you can use HTML tags properly to format your kindle and paperback books, you must be a bit conversant with the allowed tags. The four most important HTML tags to use are the bullet points tag (<li>), h1 tag (<h1>), h2 tag (<h2> and the bold tag (<b>). I listed all the allowed HTML tags above. 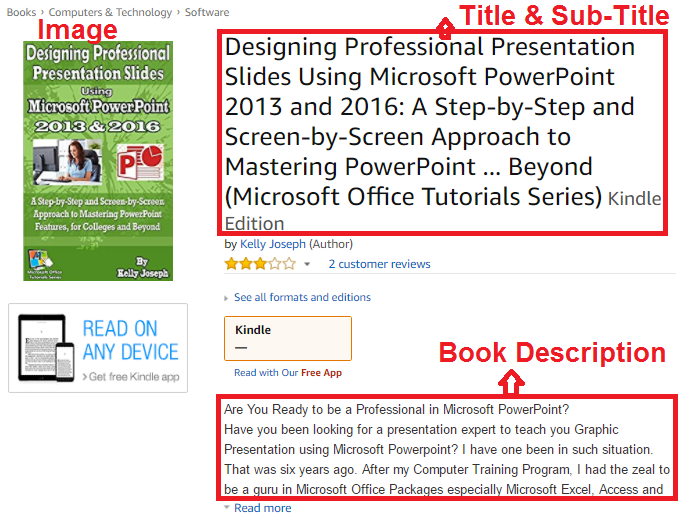 To format your kindle books with HTML tags, simply insert these tags together with your normal description texts in the description section of the KDP book setup. Simply place the opening tag (<h1>, <h2> or <b>) before the intended texts and then place the ending tag (</h1>, </h2> or </b>). For example, to use the h2 tags around the Microsoft Access 2016: Type: </h1>Microsoft Access 2016</h2>. The same applies to the h2 and bold tags. The list tag (<li> usage is a bit tricky. But it is very easy to use if you get the concept! The concept is that; to use the list tag for bullet points, you must wrap it with the opening and unordered list tag (<ul> and </ul>). First, put opening list tag (<li>) and the closing list tag (</li>) around each line or sentence in your list. Then, put the opening un-ordered list tag (<ul>) and the closing un-ordered list tag (</ul>) around the entire list itself to indicate you want it to appear like bullets. 1. Sign in at www.authorcentral.com or setup your account if you have not previously set it up. 2. Click the Books tab at the top and then select the book you want to optimize its description (or click on the Add more books if you have not added the book yet). 3. On the Editorial Reviews tab click the Edit button for Product Description. 4. 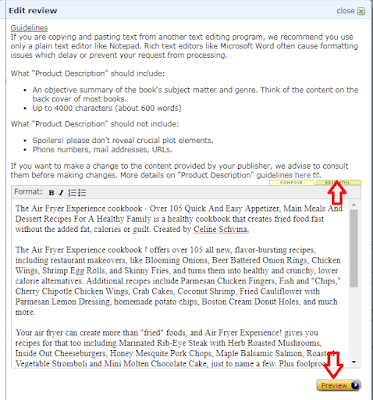 This prompts the Edit review window where you can format your book review and descriptions to your taste. To add HTML tags, click the Edit HTML tab as shown in the screenshot below. Preview it to make sure it appears properly and then save it. You can also edit add a review for your products as well as the book author’s details from Author central following the same procedure. The category of your product is one of the main elements to ranking high on Amazon. Another main element is your product keywords. If you want your products to rank well on Amazon and even search engines, then you must optimize these two elements. Amazon allows you to choose two categories for your products when setting it up for sell. Always choose categories where your book or product will be relevant when a potential buyer searches a product by category or even on search engines. 1. Also choose relevant sub-categories where your product can easily rank well. Don't go for categories that are too competitive. Always dig deep to find suiting categories. Go for relevant sub-categories that are less competitive where your book can easily rank high. Once it ranks high in that category, it will yield more sales. Also ensure that the category name (texts or word) is a keyword for your book. 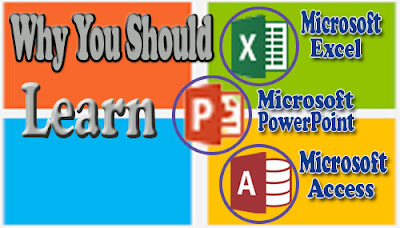 For example, if your book is about Microsoft Excel, you can go for sub categories like "Data Analysis", "Office Excel", etc. 2. Switch categories whenever you discover a new more suiting category for your product through the back end. But don't do it too often, may be once in two months. This is one of the ways your product can attract Amazon's attention and play with their algorithm. Another way to attract Amazon's attention is through product promotion. I will elaborate more on that later. Picking the right categories for your products involves intense research. The easiest way is to check the categories of some top seller in your book niche. Amazon uses customer's review to rank books and other products. The review rating system is based on 5 points or stars. Reviews rated below 3 stars negatively affect your product's rank and sales. There are many strategies you can apply even before you publish your product in order to attract high rated positive reviews. 1. For authors, always write quality contents and edit it properly. Make it easy to understand. For other product seller, always sell quality products with good branding and make sure it is able to provide solutions to the buyer's problem. 2. Optimize your product description and always remind your buyer to drop their reviews for your product. For authors the best way to achieve this is to remind your customers at the conclusion part of your book. Most customers forget to write a review for products they bought even though they enjoyed it. I use this strategy and it really works. You can also remind them at the end of your book description. For other product sellers, always include this reminder in the "How to use" leaflet of your product. It works! One of the mistakes that many authors make that always hurt their products in the long run is to pay for reviews. Don't run a paid review ad for your products. Amazon checks the sources of the reviews, if it does not seem natural, they will rank down your product. This is the total number of sales that your product accumulated from the day it was launched including the ones made during the promotion periods. Amazon checks how often your product sells with time. They rank products that make large sales progressively than those that don't sell regularly even if the sales volume of the latter is higher. Amazon also rank products that most of their sales volume come from search engines like Amazon and Google. They also rank these products high on those search keywords. 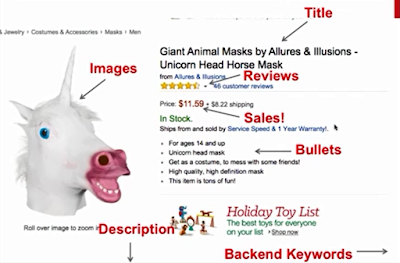 This is the more reason you need to optimize your product page on Amazon so that it will be search-engine-friendly! Selecting the suiting search keywords for your products requires great extensive keyword research. Keywords are one of the ranking elements or factors on Amazon. Amazon allows seven different keywords or strings of keywords for every product which you will be required when setting up your book or product in seven fields. CreateSpace allows five. That is why you need to know the right keywords to use for your products even before you start the setup process. Other places you can place keywords for your product is in the title, subtitle or description. But don't overdo it else it hurts your sales and ranking. The quickest and easiest way to find the suiting search keywords for your books and products is to use Amazon search engine to search one of your product's main keywords. The search engine provides you with suggestions. 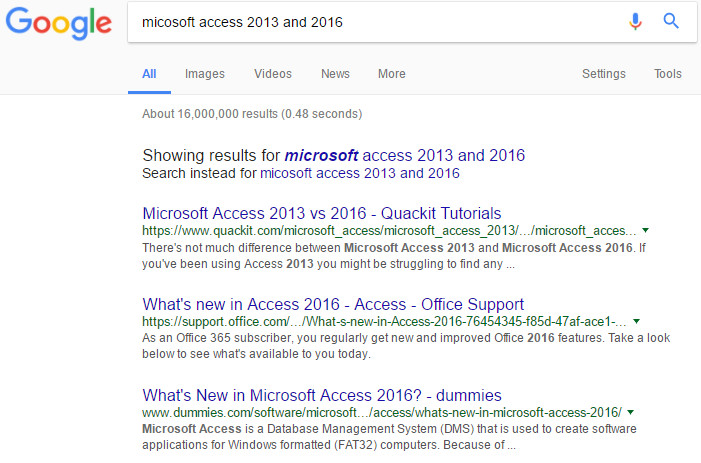 For example, if you wrote a book on Microsoft Access 2016, one of your main or primary keywords maybe "MS Access". It does not end there! You need to carry extensive keyword research using these suggested keyword with some keyword research tools like amz.one, a research tool provided by amazon to help authors and sellers optimize their product pages. It has both free and premium versions. 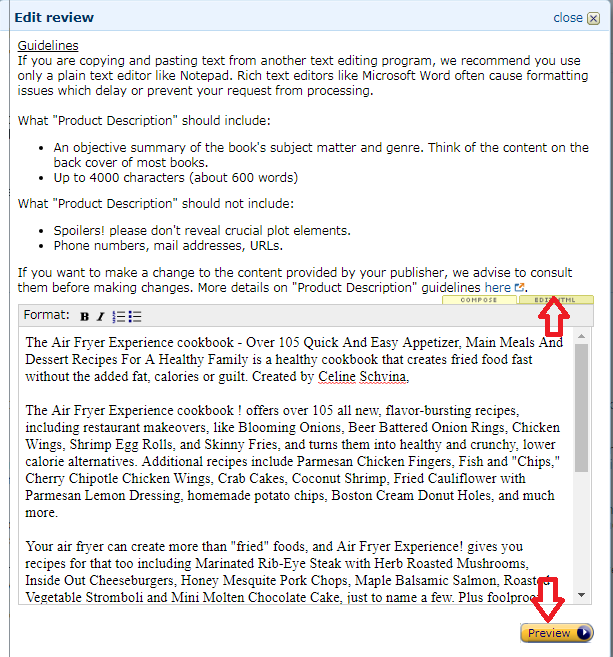 Note that your primary keyword should appear two to three times for every 150 to 200 words in your book description. 2. Use all the available keyword fields and spaces. On Amazon, there are seven fields that accept 50 characters each. 3. Do not need to repeat any words and do not use commas because they will be ignored. 4. Do not use quotation marks because they will unnecessarily limit your keywords relevance to search engines. 5. Do not include multiple variations and synonyms of some words like "textbook" and "text book". It is just repetition and misuse of keyword space. Also note that including common misspellings is unnecessary. 6. Research for more relevant keywords and change the keywords occasionally from the back end. Your Amazon product canonical URL and super URL are very important when it comes to product SEO. A Canonical URL is a direct link to your product’s detail page which contains keywords chosen by Amazon from the words that make up your product’s title, separated by hyphens. It is generally referred to as the URL slug. One of the main reasons why you should optimize the canonical URL of your product is because search engines like Google indexes them for search results when crawling your product. For example, if you search my MS Access book on google using the title: Designing Professional Database Management System Using MS Access 2013 & 2016 & MySQL, Google will display the Canonical URL on the search result as shown in the screenshot below. Note that your product canonical URL is the same as the default product URL that is of this form: https://www.amazon.com/dp/ASIN. The difference is that the latter does not include words from your product title. Method 1: The first method is to search the product on google using the product title. Right click and then copy the canonical URL from the search result as shown in the screenshot above. Method 2: The second method is to search for the product on Amazon search engine and then visit the product’s page through a search result. On the product's page, inspect the page elements using your browser’s developer tools or by right clicking and then select View Page Source. On the source code page, press Command + F (or Ctrl + F for PC users) to search the word “canonical” and then copy the product Canonical URL as shown in the screenshot below. The super URL of your Amazon product is the custom URL or link you can create, choosing your desired product target keywords by your self. When this link is clicked, it will expand into a full URL that leads straight opens your Amazon product details page and signals to Amazon that the keywords you entered are very relevant to your product. It is advisable to generate a Super URL for your product because it tells Amazon that your product deserves to be ranked higher when someone searches for your targeted keywords. As this happens, your products rankings start increase and as a result sell more. The difference between a Canonical URL and a Super URL is that Amazon itself generates a canonical URL for your product while you generate your product's Super URL with the help of some product optimization tools like amztracker, sellics, etc. Paid advertising campaigns like Google Adsense and other PPC networks like Bing Ads, Google Adwords, Facebook Ads, etc. These help your product to rank higher. To learn how to setup a Super URL for your Amazon product, check out this article on amztracker.com at http://help.amztracker.com/article/31-how-to-super-url-tool. These will help you to know what exactly your customers will like to see in your product. Amazon listing optimization tools help to boost your product rank without much stress from you. They also help you track your product performance and find the right and profitable keywords for your products and also help you to generate super URL for your product. But note that you need to personally improve the quality of your product before you use these product listing optimization software. Most of these optimization tools have a trial and premium (paid) versions. The trial version normally lasts for a month (30 days) and does not include all the features available in the paid version. Also Amazon Feedback tools help you to gather feedback from your customers after they purchased your product on Amazon. Getting feedback from customers is very essential because it will help you improve the quality of your product and to avoid negative reviews as much as possible. The truth is that most customers don't voice out their feeling but they conclude within them not to do business with you. If you carefully implement these SEO product listing strategy for your books and products tips, your products will gain more traction, visibility, exposure, sales and ranking. Do you have any question or contribution on how to optimize your products? I will be glad to hear from you in the comment box below. Also click the share buttons to share this tutorial article. 2 Hy, your posts are quite helpful dude, not a waste of time and I learned a lot.Keep It Up! Well, this is a nice posy that requires accurate follow up. Thanks for sharing. 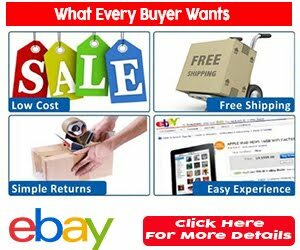 I also suggested sellerseo.com, it really helps optimize your Amazon listing. I've been using this for a couple of months and the most awesome thing my first month is free.